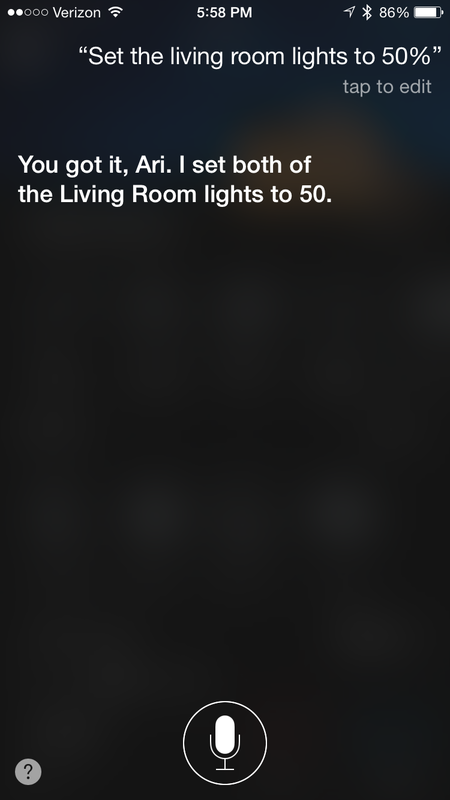 “Hey Siri, set the living room lights to 50%” I barked at my phone. Seconds later, as if I was living in some futuristic world, my lights were on. My phone responded politely. “You got it, Ari. I set both of the living room lights to 50” sung the small electronic portal in my hand. Has the ability to control one’s home with your voice finally arrived? Let’s take a quick look at the new Lutron Caséta Smart Bridge (L-BDG2-WH) with Apple HomeKit Siri capabilities to see just how science fiction our lives may really have become! Right now the list of compatible devices that work with Apple’s new HomeKit platform is small (see HERE), but that list is growing fast. Later this year the spectrum of compatible products is really expected to hit its stride, when many of the earlier-announced partners release their respective new hardware. One of the interesting aspects that I’ve seen thus far is that many devices require an upgrade in order to work with HomeKit. And not just a software update, rather in most cases a brand new shiny piece of hardware. For many of us that will come as a shock, and an unwanted expense, since the older hardware you have might not be upgraded to HomeKit compatibility simply by means of software. In my case the old Lutron Smart Bridge that controlled my home lighting continued to function, but added no HomeKit functionality even with the new iOS app update. In order to harness the HomeKit features I had to upgrade my hub to the Lutron L-BDG2-WH Smart Bridge, which adds Siri voice integration. Though setup for this device is a bit more involved (given my high volume of switches), you may find this less problematic if your home has less hardware to reconfigure. I’ve reached out to other manufacturers (such as the maker of the Chamberlain MyQ) to find out if their hardware will also need upgraded or how that might work. Chamberlain’s support team claimed the old units “should” work though I’ll believe it when I see it (the rep’s email wasn’t very convincing). And we can probably all safely assume certain devices, made by competitors to Apple, may never obtain MFi / HomeKit certification. Pictured above is the box for the new bridge/hub. 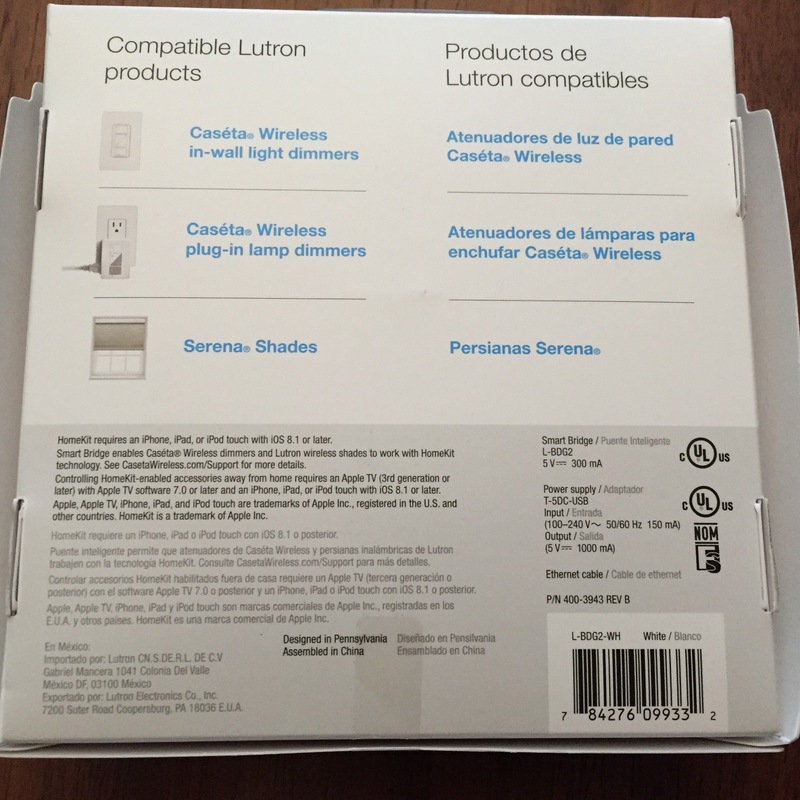 One thing that I haven’t yet tested but found interesting is the mention on the back of the Lutron Smart Bridge box that using an Apple TV would allow me remote access to controlling the lights. Though I’ve not needed this feature, and do not currently own an Apple TV, it is worth noting here that recent news indicates iOS-9 will bring updates to HomeKit in which devices will be able to use iCloud to communicate. This should eliminate the need for an AppleTV for remote control, while still providing HomeKit functionally when not on the same WiFi as the devices themselves. Look for more on that in the fall- but the bottom line is you do not NEED an Apple TV, unless you want to control these devices using Siri remotely. And even then, you may not need that come the Fall. What I’ve found most curious during the entire setup of the HomeKit experience was that the functionality is created on the app. Specifically, the naming of rooms or zones is done at that level, rather than in some global place. This is odd to me because it will stymie future expansion. Right now I’m telling the Lutron Smart Bridge app to group some lights into a room called “Master Bedroom” — but down the road, what if I had another lighting app? Do I have to be careful to name the room the same thing, so that it works properly? 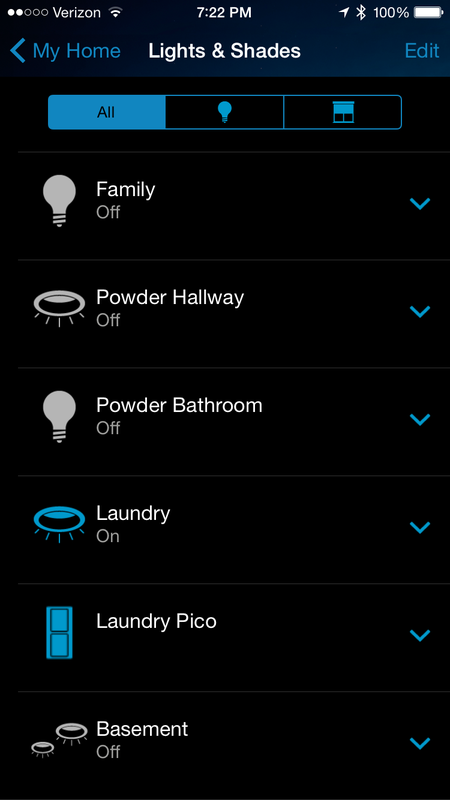 Can you use more than one lighting app at a time with HomeKit? These details aren’t clearly outlined anywhere that I’ve been able to find. Adding a HomeKit device requires accessing some special code off the bottom of the hardware. From there you can create Rooms and Zones, though that isn’t entirely necessary. 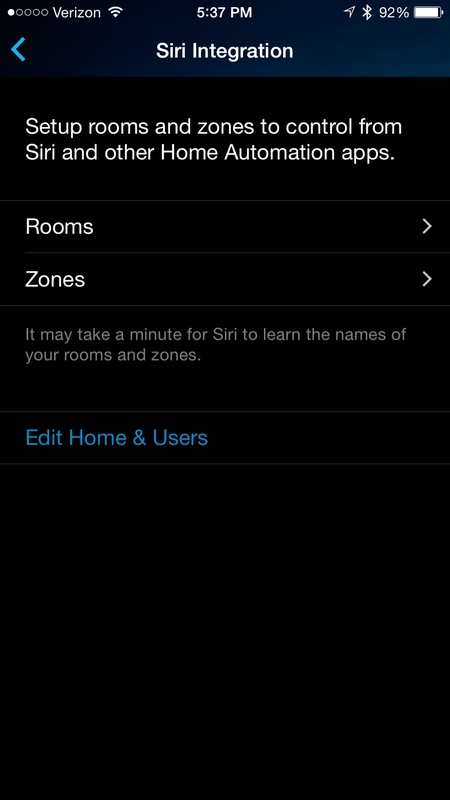 You can simply tell Siri to turn on/off or dim specific items by name, but the use of Rooms and Zones is ideal for grouping. In my case, for example, I have two lights/switches in my living room, and was able to link them together for purpose of voice control. And having a split level home, I was able to group the upper, middle, and lower floors, again making it easy to turn on/off lights in those zones in a faster, more global method. Setup is pretty basic, hence pretty simple. All you’re really doing is again grouping items already in your home, placed together by rooms and zones. Siri takes care of the rest. It prevents you from naming a room the same as an existing light (to avoid complications) — but again, does this integrate somehow back into some central database in the phone? Curious about that, again for cross-platform functionality as I mentioned. 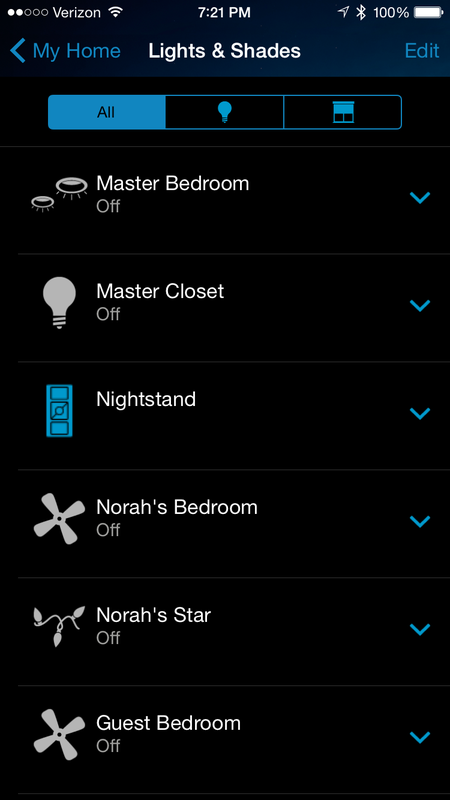 Once you’re done setting up those items in the Lutron Smart Bridge app, it is time to play! Note that in this video you can see many of the upstairs lights in the background, one of the two living room lights (that wall sconce), and off to the left you can even see the foyer. This was a good central location to provide background visibility as I turn lights on/off with my voice/Siri. What I also wanted to show here is that while things work good, they don’t always work great. You have to be fairly articulate in what you’re asking for; leaving out the word Light(s) may cause the action to not perform. But the worst glitch is asking Siri to turn on a light that doesn’t exist, which in turn causes all the lights in the house to turn on. This could prove dangerous if you have sleeping children such as i do. Generally speaking, Siri does a good job, and the features worked pretty flawlessly. I did find it confusing (my own fault) as to how I named things, and my wife/I realized we might not both refer to certain rooms with the same label. There isn’t yet support for rooms to have multiple labels (i.e. : den vs family room), a feature I would like to see them add. I’m also anxiously awaiting Apple Watch 2.0 (also slated for Fall release) which will provide voice controls right from my wrist. 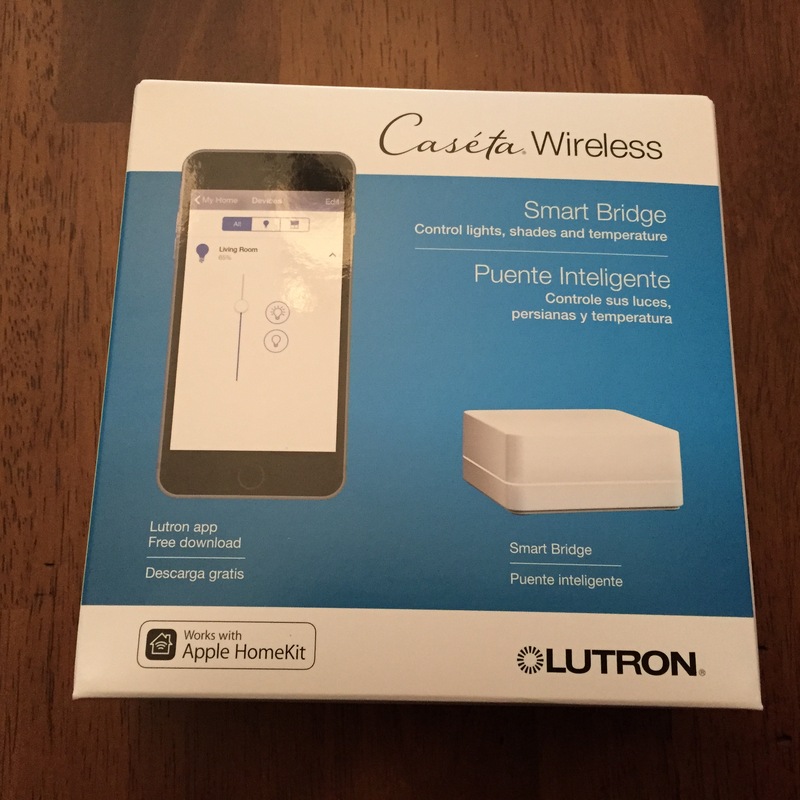 The Lutron Smart Bridge does support Apple Watch with a pretty nice and powerful app, but HomeKit doesn’t yet provide Apple Watch voice features. Again, this is supposedly coming soon! 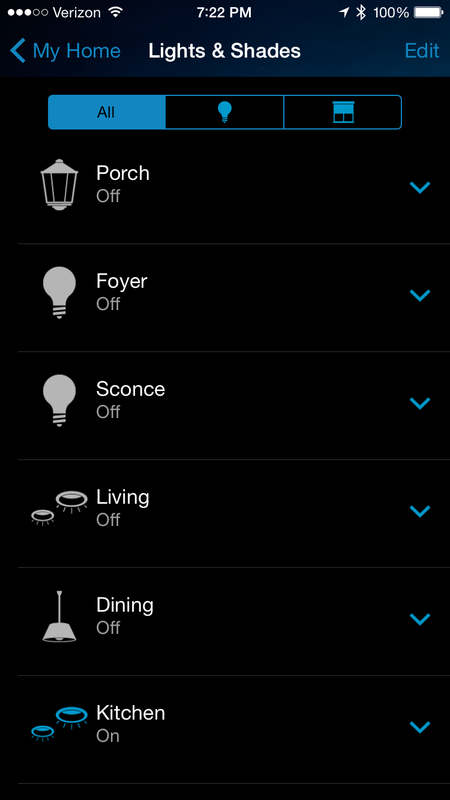 At first I really didn’t see the point of voice control for my home lights. 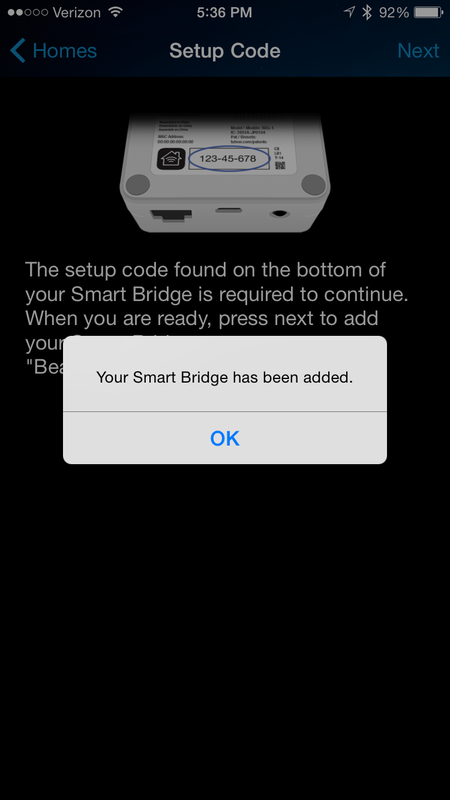 Up until now I had been pretty satisfied with the Lutron Smart Bridge and its iOS app. I’d also been pretty happy to use my Apple Watch too. I thought that voice controls would be rather pointless. But when you’re sitting there in a room that you suddenly realize is somewhat dark and you want to turn on the light, it is typically faster to command this by voice, versus bringing up the correct app/screen. Features beyond Siri that make the Lutron system great include Geofencing (reminding you when you leave home to turn off the lights remotely, or turning on certain lights when you arrive home). Later this year the updates to HomeKit will also add “Scene” support, which will allow you to use the already existing scene functions of the Lutron Smart Bridge with Siri (right now you can only turn on/off specific lights, rooms, or zones– but not set scenes). With more HomeKit compatible devices now just weeks or months away, you can see how this will soon work. Want to set the mood for watching a movie, with certain lights and other devices set to a specific state? Want to tell Siri goodnight, and have her lock doors, close the garage door, and turn off all the lights? 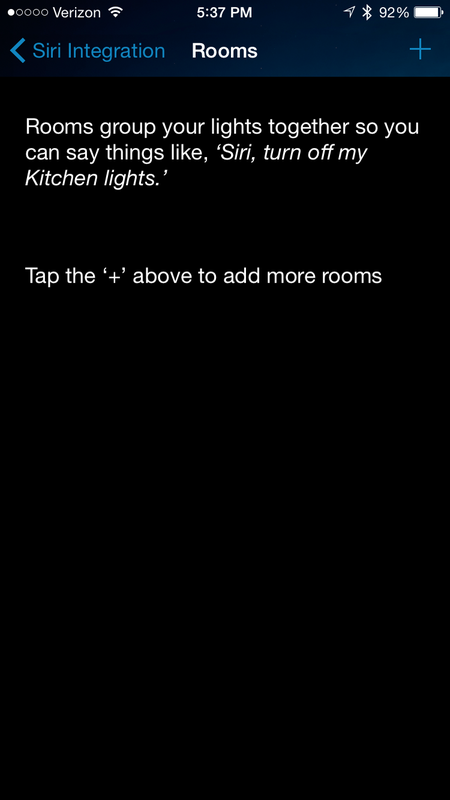 These commands and more are just the start of where HomeKit is headed. Based on what I’ve seen here, the next iteration of HomeKit should build upon this already fairly robust network, and as more hardware presents itself, the usefulness will grow that much more. Now if only I could ask Siri to go get me a cold beer…..
I’ve got 8 lights controlled so far and love this setup. I really wish I could add zwave devices that I own but can’t use without choosing another controller. I think the Siri control is neat but I’d really love Amazon echo support, which is always on and listening. Friend of mine just ordered an Amazon Echo. Will be curious to see how it integrates with her smart home. And check out Insteon their new hub supports HomeKit – plan to test that soon! Scheduled events are definitely stored in the bridge. I just created a test event on my android and it immediately appeared on my iPad. Interestingly, the list of devices appears to be local to the mobile device. On my android I see none of the devices that I set up on the iPad. Only those set up directly on the android. Also, when I edit an event on the android I get no devices when I expand the list. It looks like it’s trying to retrieve them (I would have assumed from the bridge) it comes back empty. I wonder if it fetches a list of device IDs and finds no corresponding devices set up in the mobile app? I’m very happy with the Lutron setup so far, but I really want to find a way to manually trigger scenes for security reasons. I want to use door sensors to turn on all exterior lights, for instance. Of course, I’d just want this to happen when we’ve somehow designated that no such events should be occurring (sleeping). HomeKit v2 (iOS 9) should add some abilities to tie your triggers. Meaning a home kit enabled hub that triggers from a door for example, could turn on lights and such. But nobody knows for sure. The fall can’t come soon enough! Well, except that Lutron only supports lighting and shades, so I highly doubt door triggers will suddenly save the day. Ari, question – you have a Staples Connect with which you’ve connected your Lutron switches/dimmers. 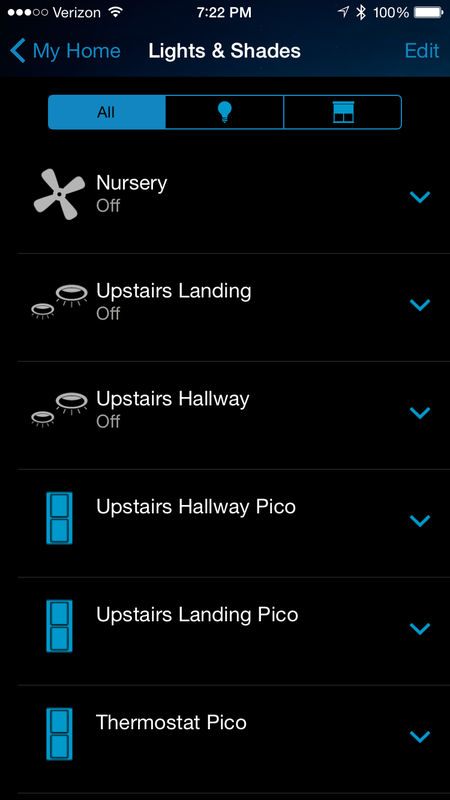 Are you able to control the Lutron devices from BOTH the SC hub/app and from the Lutron app? How about from the SC hub/app and Siri? I’ve got a bunch of Lutron dimmers in my home along with the Homekit Hub and I’ve ordered a SC hub, but I’m afraid I’ll have to disable Homekit to control them from the SC hub. Are you able to do both? Switches can only be paired to a single hub at a time. I no longer use my Staples Hub for any Lutron hardware. 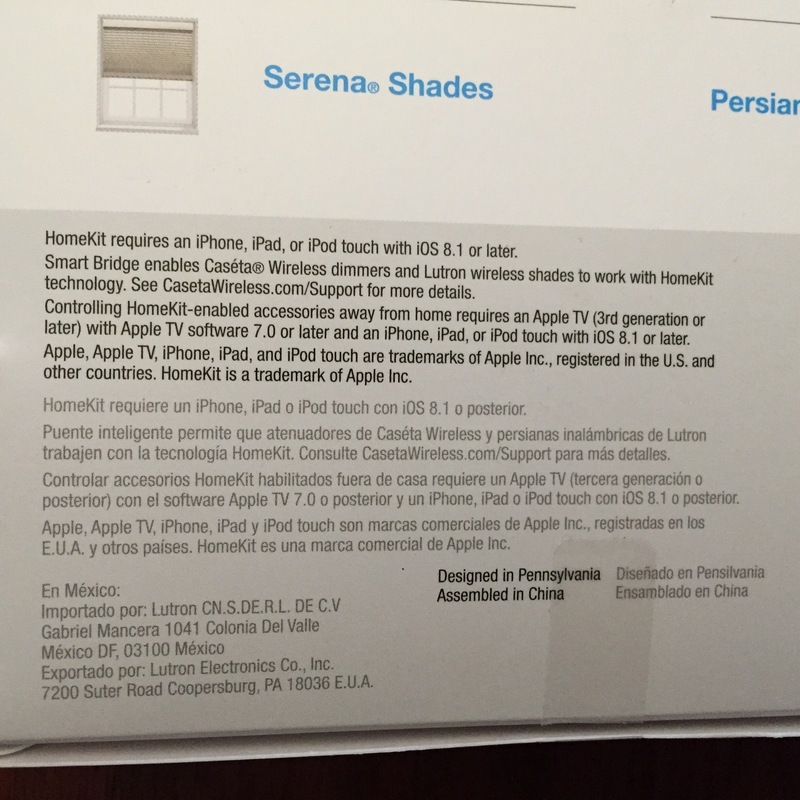 If you want to use Siri and Home Kit you’ll need their (Lutron) Hub. And your lights will not be part of your Staples setup. It is one or the other. For me I use the Staples only for my zwave devices at this point now. This was my preferred method. Let me know if you have any other questions. Thanks for the feedback. I was afraid it would be one or the other. I have a lot of Hue bulbs too, so at least the SC can automate those. And for what it’s worth, if you feel like tinkering and have a Mac you can leave on & running, there’s a hack posted on Reddit that gives you Siri/Homekit control of a Hue hub. Works pretty well and seamlessly with the Lutron Siri control. The Hue app and timers continue to function normally. I finally decided to give the Wink a try. Migrated one of my dimmers from the Lutron to the Wink. – Amazon Echo support!!!!! “Alexa, turn on the back hall”. Woo hoo! – I can (haven’t yet) add additional sensors to control lighting, like turning on all the lights in and around the barn if the door opens between midnight and five am. – Can’t seem to schedule lights! – Can’t seem to be able to dim lights! – The Lutron controller seems to have better range. Wink claims only 30 ft, which is awful. – A device belongs to a single controller at once and neither controller is perfect. I really resent the fragmented market and glaring omissions in each product. As for dimmer– make sure you add the right type of light to the Wink hub. If you chose it was an on/off switch, not a dimmer, then it might not realize it can be dimmed. Of course again its been a while since I used it, but my Lutron switches did dim okay, I think. Overall I found the Lutron setup works better, like you said greater distance, less latency, etc. Also, it doesn’t have Echo support, but the new Lutron Bridge supports Home Kit, which is a “close second” if you’re an Apple iOS device user. Best of wishes with your smart home setup! Echo can’t dim Lutron dimmers (yet). I think the only lights Echo can dim presently are Hue bulbs. Siri and Homekit can dim Lutron dimmers but not Hue bulbs (again, at present). For me, Wink’s Lutron range is well over 30 ft, but I suppose can vary with architecture. 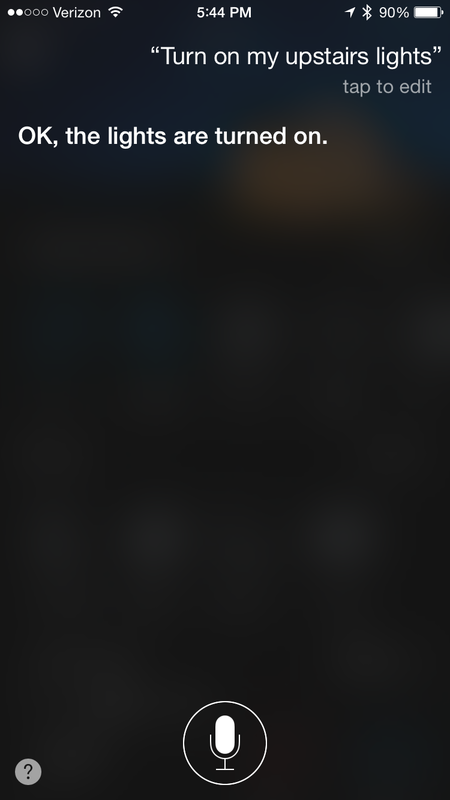 Lights can be scheduled with Wink but the scheduler is kind of hidden in the sidebar. Oh – addendum: Wink has no problem controlling Lutron dimmers (including scheduled) and can control brightness of Hue, GE Link and Cree bulbs as well. Thanks for clarifying Mike. I just went back in and poked around some more. To me the UI is NOT intuitive, but once I have it figured out I can live with it. You’re absolutely right, I can dim the light, but boy, it hadn’t occurred to me that you need to long press the light to get to a dimmer control. And for scheduling … ah … that’s where it is! Thanks again Mike, I’m feeling better now about converting over from the Lutron, even though that’s such a nice controller. It’s just too closed and has no echo support. If it had echo support I’d probably just live without being able to add additional devices. With the Wink app you can also dim/brighten by sliding your finger back and forth on the circle icon for either individual lights or for light groups. Once you figure that out, it’s not too bad (long press not required). Hopefully Amazon Echo brightness control for Lutron lights comes soon, but the ability to voice control other non-Homekit devices gives (IMHO) the Echo + Wink the edge over Homekit. May be different in 6 months, but that’s how these things go. Are you able to test for remote Siri access (on LTE) without an Apple TV running iOS 9? I see that iOS 9 has support for HAP (HomeKit Accessory Protocol/iCloud remote access) allowing you to access HomeKit devices on LTE without needing an Apple TV. 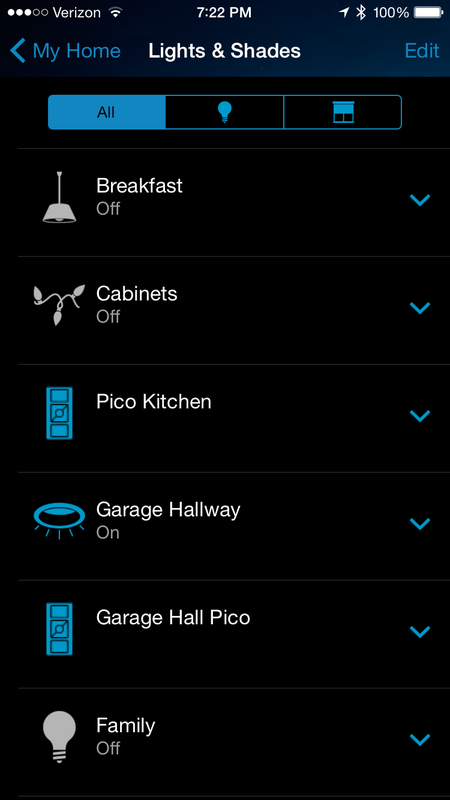 Could you verify that Siri works away from the home to control the Lutron hub? An article from Cnet says that manufactures will need to upgrade their software to take advantage of iCloud remote access, meaning that you might need to wait for an app update to enjoy HomeKit control while out of the house without an Apple TV.